Whether you’re a regular part of the UVic community or simply a visitor to campus, Ideafest 2018 offers an ideal chance to explore the vast and diverse range of research and creative activity happening all around the Ring Road. Fine Arts is offering five distinct events this year, and participating in some others as well. 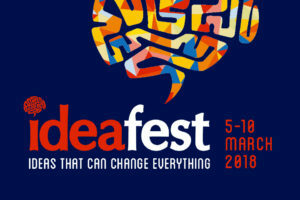 Rightfully described as being about “ideas that can change everything,” UVic’s week-long festival of research, art and innovation runs March 5-10 and features over 40 events on topics ranging from climate change and chamber music to Indigenous law, optimistic art, antibiotic resistance and so much more. All events are free and open to the public — please join us at any or all of our signature Fine Arts events, and be sure to take time to explore the full schedule as well. You never know what your new favourite topic might be! First up on the Fine Arts schedule is the annual reading night featuring Department of Writing MFA candidates. 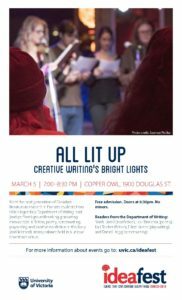 Hosted by award-winning playwright and Writing professor Kevin Kerr, All Lit Up: Creative Writing’s Bright Lights offers live readings and performances by the next generation of Canadian literati, including Levi Binnema (poetry), Sarah Hamill (nonfiction), Daniel Hogg (screenwriting), Elliott James (playwriting) and Kari Teicher (fiction). Enjoy this lively (and licensed) literary cabaret from 7 to 8:30pm Monday, March 5, at the popular Copper Owl — one of downtown’s most unique and charming arts venues, (upstairs at Paul’s Motor Inn, 1900 Douglas). Doors open at 6:30, and this event always packs out so do arrive early. Note: no minors. For over 50 years, UVic’s School of Music has had a long history of producing outstanding string students — helped along in no small measure by the Lafayette String Quartet, who have been artists-in-residence here since 1991. Now, you can discover the next generation of outstanding string talent with Cuarteto Chroma — Canada’s first graduate student string quartet. 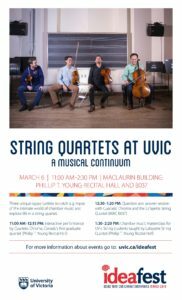 The event String Quartets at UVic: A Musical Continuum offers an interactive performance where Cuarteto Chroma will invite the audience to suggest how they should perform a particular piece — deciding things like tempo, vibrato and the balance between each instrument — which will allow the audience to hear the effects their choices have on the musical outcome. Afterwards, Chroma will join the Lafayette String Quartet for an informal Q&A session, followed by a Lafayette-taught masterclass for UVic string students — that’s three opportunities to catch a glimpse of the intimate world of chamber music and explore the hidden facets of life in a string quartet. A Musical Continuum runs 11am-2:30pm Tuesday, March 6, in room B037 and the Phillip T. Young Recital Hall, both in the School of Music’s MacLaurin Building B-Wing. Performers will include the Lafayette String Quartet (Pamela Highbaugh Aloni, Ann Elliott-Goldschmid, Joanna Hood and Sharon Stanis) and Cuarteto Chroma (Felix Alanis, Manuel Cruz, Ilya Gotchev and Carlos Quijano), as well as undergraduate string students. Interactive performance runs 11am–12:15pm in the Phillip T. Young Recital Hall, while the Q&A session runs 12:30–1:20pm in B037, and the chamber music masterclass runs 1:30-2:20pm back in the Phillip T. Young Recital Hall, just next door to the classroom. If Bobby McFerrin’s classic singalong ditty “Don’t Worry, Be Happy” isn’t quite cutting it for you these days, art may be the answer: in troubling times, optimism can feel like a scarce commodity, but for centuries people have found hope and joy in visual art. 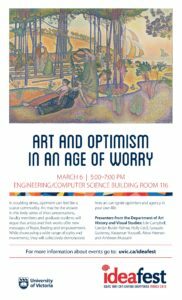 Art and Optimism in an Age of Worry offers a lively series of short presentations as Art History & Visual Studies faculty members and graduate students will explore how artists and their works have long offered new messages of hope, healing and empowerment. While showcasing a wide range of styles and movements, they will also collectively demonstrate how art can ignite optimism and agency in your own life. Join host and AHVS professor Catherine Harding from 5-7pm on Tuesday, March 6, in room 116 of UVic’s Engineering & Computer Science building (ECS), where she’ll be joined by fellow AHVS professors Erin Campbell and Carolyn Butler Palmer, plus grad students Holly Cecil, Gonzalo Gutierrez, Alexa Heenan, Ambreen Hussaini, and Katayoun Youssefi. 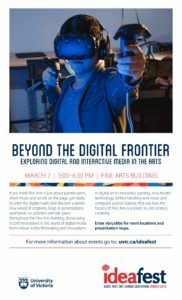 If you think Fine Arts is just about paintbrushes, sheet music and words on the page, get ready to enter the digital realm and discover a whole new world of creativity when you go Beyond the Digital Frontier: Exploring Digital and Interactive Media in the Arts. From virtual-reality filmmaking and innovations in digital art to interactive gaming, artifact handling, new theatre technology and into the recording studio with Vancouver rockers Bend Sinister, find out how UVic’s Faculty of Fine Arts is a leader in 21st century creativity at this interactive, drop-in, self-guided exploration event. Professors Kelly Richardson (Visual Arts), Kirk McNally (Music) and Victoria Wyatt (AHVS), plus technician Simon Farrow (Theatre) and both graduate and undergrad students will showcase recent innovations in the world of digital media from 5-6:30pm on Wednesday, March 7, throughout UVic’s Fine Arts Building. And you’ve got the entire week of Ideafest to explore the Visual Arts exhibit Math Garden. Conceived of as an outdoor concept exhibition by Visual Arts instructor David Gifford, Math Garden explores some of the visual aspects concerned with popular mathematics. Topics such as amounts, shapes and change will be imagined by the undergraduate drawing class of ART 300, whose motive is to celebrate a handful of patterns that are present in this abstract discipline. Math Garden is inspired by Mathematica, an exhibition of mathematical concepts by Charles and Ray Eames that debuted at the California Museum of Science and Industry in 1961. The self-guided exhibit in the Fine Arts Building courtyard will also include didactic panels for the purpose of intellectual entertainment, including the explanation of potentially difficult concepts through pictures and interactive sculptures and installations. While those are our signature events, Fine Arts students will also be participating in the likes of the annual Jamie Cassels Undergraduate Research Awards (JCURA) Fair from 11:30am-3pm on Wednesday, March 7, in UVic’s Student Union Building, as well as the new creative writing contest On the Verge: Student Voices, co-hosted by UVic’s Libraries and Equity & Human Rights, from 4:30-6pm on Thursday, March 8 in Libraries room 129. And will any of our short films about creative practice in Fine Arts make the final cut of the second annual Research Reels contest? To find out, you’ll have to drop by the screening event running from 5-6:30pm Tuesday, March 6, in the David Lam Auditorium, room A144 of the MacLaurin Building.